New Zealand’s small but growing Muslim population is in the news of late after a terrorist attack left 50 dead and dozens injured at two mosques in Christchurch last week. 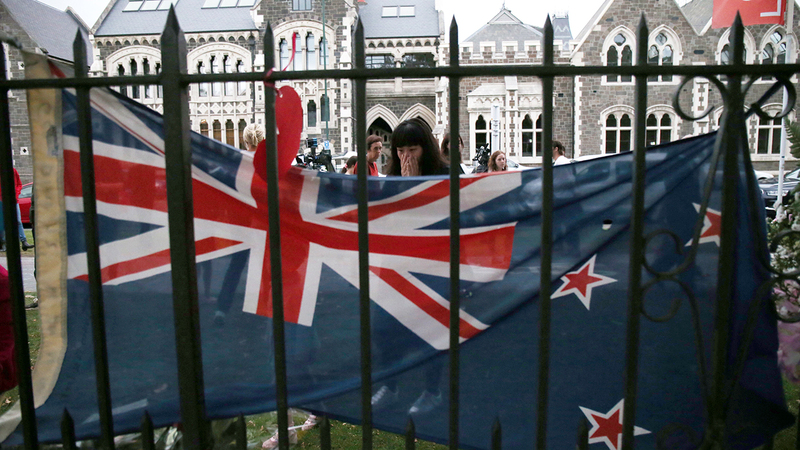 Many have expressed shock that these attacks could occur in New Zealand, where crime rates are low, mass shootings are rare and people are largely accepting of religious minorities and immigrants. At the same time, world leaders cite the massacres as the latest example of rising nationalism and Islamophobia around the world. Here are four facts about religion and religious tolerance in New Zealand. 1Almost all New Zealanders said in a 2011-2012 survey that they would accept a neighbor of a different religion. The World Values Survey asked New Zealanders to mention groups of people they would not like to have as a neighbor. The list of choices included “people of a different religion” as well as other possibilities such as drug addicts, heavy drinkers and people of a different race. Among the 841 New Zealanders interviewed, only 12 said they would not like to have a neighbor of a different religion (less than 2% of the sample). Additionally, just 6% reported that they would prefer not to live near an immigrant or foreign worker and only about 3% would not live next to a person of a different race. By comparison, when results from all 58 countries in the 2010-2014 World Values Surveys are combined, about 20% of respondents reported that they would not like to have a neighbor of a different faith. 2Muslims make up a very small share of the population in New Zealand, a country with fewer than 5 million people (about half the population of Los Angeles County). Muslims comprise roughly 1% of New Zealand’s general population. However, while this group is expected to remain small, it is growing, mostly due to immigration as well as to their relatively young median age and higher fertility rate than the general population. Muslims are expected to make up about 3% of New Zealand’s population by 2050. The Muslim share of New Zealand’s population is similar to those of neighboring countries. Muslims represent a small minority in Australia, where less than 3% of the population is Muslim, and Papua New Guinea, where fewer than 1% are Muslim. 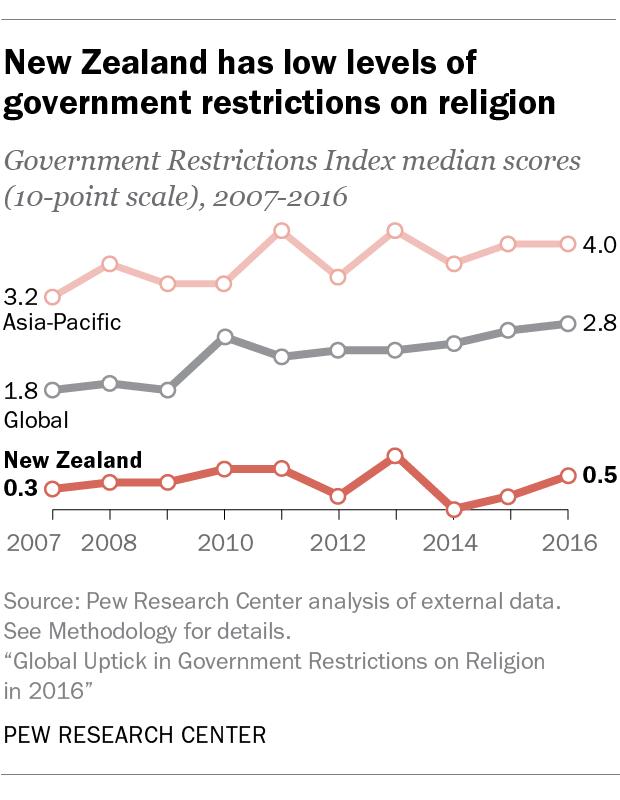 3 New Zealand has some of the lowest levels of government restrictions on religion in the world, with a score in 2016 of just 0.48 out of 10 on Pew Research Center’s Government Restrictions Index (GRI). Still, while New Zealand’s GRI score has been low since we first began measuring it in 2007, it did tick upwards slightly in 2016. This recent increase is due in part to derogatory statements made by Winston Peters, leader of the New Zealand First Party, when he said in June 2016 that certain countries “treat their women like cattle,” and suggested that all immigrants should be screened for unacceptable attitudes before being permitted to enter the country. Some media reports said he specifically referred to Muslim immigrants, which he denied. 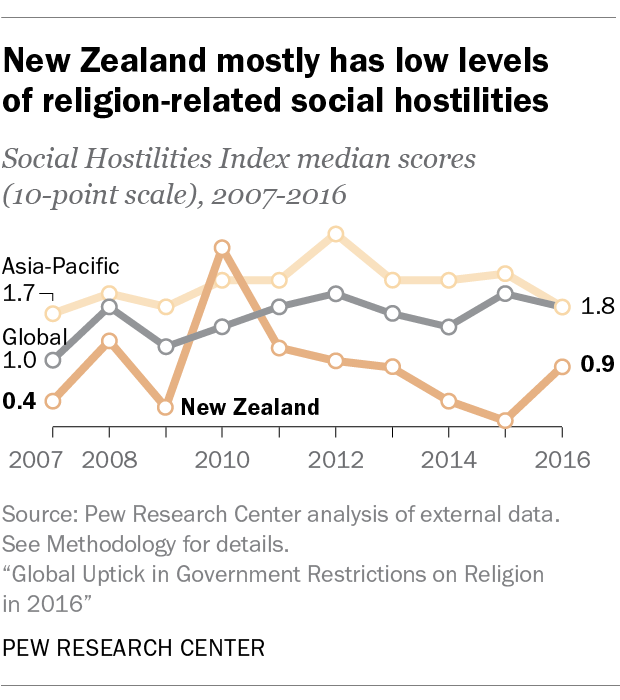 4 New Zealand had “low” levels of social hostilities involving religion in 2016 (with a Social Hostilities Index score of 0.9 out of 10). There have been incidents of religiously motivated violence and hostilities in the past, although these cases have been relatively rare. In September 2016, for example, the Whanganui branch of the Right Wing Resistance, a right wing organization, circulated pamphlets that accused Muslim refugees in the country of intending to change the culture of New Zealand to suit themselves and to “kill anyone” who did not believe in God. Katayoun Kishi is a research associate focusing on global restrictions on religion at Pew Research Center.